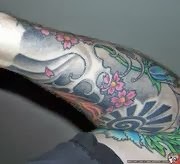 The cherry blossom continues to be a popular image in Western interpretations of Japanese style tattooing, often seen gracefully floating intact or with the blossom's petals scattered through wind or waves that form the background behind larger figurative images that comprise the tattoo. When most unmodified people think tattoo, two images are usually quick to come to mind: the snarling black panther/heart/rose Americana, or the elemental simplicity of the Japanese Irezumi, complete with the four elements and a snarling dragon. But few people (even tattooed people) realize the elements that make up the dragon. 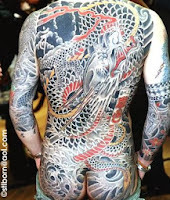 The dragon appears in Chinese, Japanese, Indian, Grecian, European, and Mexican mythology (as well as many others) and can make for a fairly dynamic tattoo subject. BuddhisT. Literally 'Immovable King of Light,' Fudomyo-O is the Japanese rendition of the Buddhist deity Acalanatha, the wrathful aspect of the Buddha. 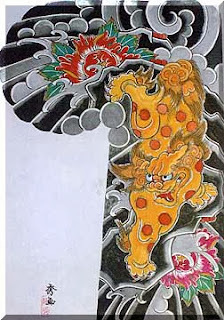 A popular Tattoo design, Fudomyo-O is usually pictured with a lasso in one hand to bind the faithful, and a sword in the other to cut through ignorance, on a backdrop of fire which purges all wickedness. 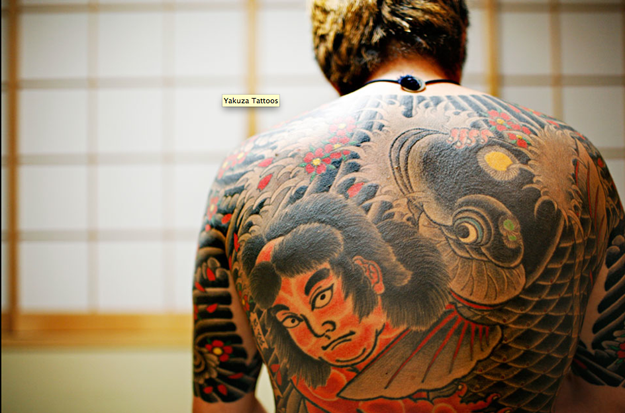 A tattoo of Fudomyo-O protects its wearer from evil and natural disasters (like fires). The kara-jishi (唐獅子, lit. "China Lion") is a Japanese mythological animal. The kara-jishi is venerated in East Asia—especially in Buddhism—as the king of all animals. Pairs of stone kara-jishi are commonly displayed at the entrances to temples and shrines as guardians. In horimono tattoos, the kara-jishi is almost exclusively depicted with the peony, or botan, which is correspondingly considered the king of all one hundred flowers; a tattoo of the two kings together represents the pinnacle of the terrestrial kingdom. As many tattoo artists in the West incorporate Japanese designs into their work, the kara-jishi can be seen in many tattoos in America and Europe; curiously North Americans often refer to the kara-jishi as a "Foo Dog," although originally according to Chinese mythology, they represent lions. Koi is the the shortened term for Nishikigoi, the Japanese word for carp. Although decorative koi were first cultivated in Imperial China, they arrived in Japan during the 8th century CE and have been highly regarded as pets ever since. Today, a prize koi in Japan can command tens of thousands of dollars at auction, with those specimens displaying a round blood-red mark on the head with a pure white body, which represents the flag of Japan. In China, the legend of 'Climbing the Dragon Gate' recounts how koi carp that can scale the waterfalls of the Yellow River turn into dragons. In Imperial China, students sitting the civil service entrance exams were said to be attempting to 'scale the waterfall'; those who passed were allowed to wear clothes printed with a three-clawed dragon design as a symbol of their station. In Japanese culture, koi carp represent perseverance and bravery. Their whiskers also denote wisdom. For example, on the public holiday known as Children's Day, tubular flags fashioned in the shape of koi are flown in the hope that the children, too, will grow up to be as strong and resilient as koi carp. In some rural villages, capturing koi with one's bare hands (Koi Tsukami) is a rite of passage for young boys. Traditionally, a koi tattoo would be done on the forearm or leg of a young man in the hopes that later on in his life he would be able to 'earn' a dragon for his final back piece. Because of this and their marked appearance within Japanese folklore, the koi carp remains a very popular design for horimono tattoos. Different types of koi (coloring, whisker quantity, scaling) symbolize different wishes for a young man's future, to be strong, to be great, to be loyal, etc. Tancho koi, a white koi with a single red spot on the head, can sometimes connote national pride as well as desire to be great. The tancho koi is prized among collectors for its resemblance to the Japanese national flag.